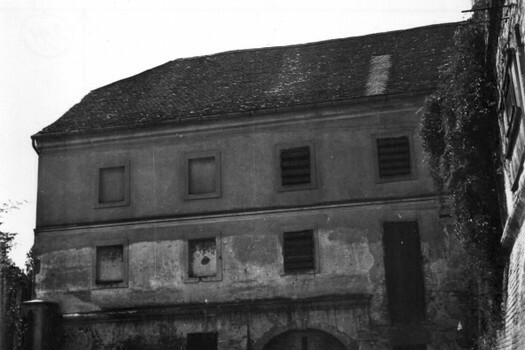 The building of the Valtice Castle Theatre was undertaken from May to October 1790 during the rule of the Prince Alois I Joseph of Lichtenstein (1759-1805). It cost 18 000 guldens including equipment. 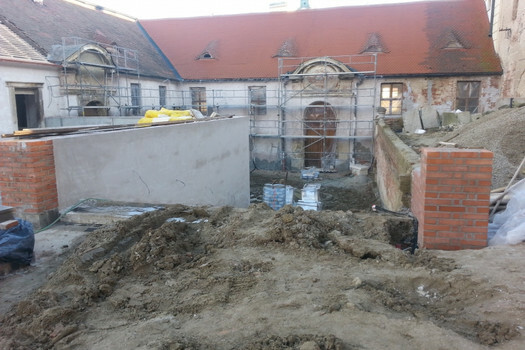 This building was the last important unit of the ambitious constructional metamorphosis of the Valtice Castle into an impressive main family residence in the 17th and 18th centuries. 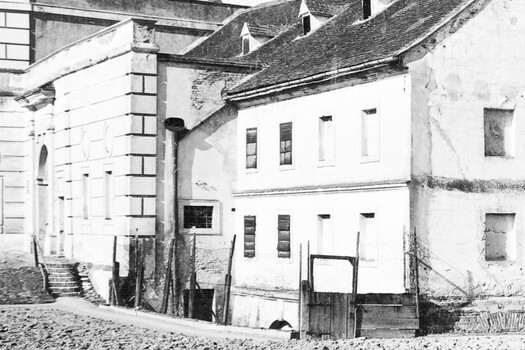 The one-room building of the theatre with a rectangular ground plan was built by Karl Jan Rudzinsky (1751-1818) whose father was not only a clerk of the Liechtenstein family– an architect – but also a director of the Adamov and Josefov ironworks. Scientific research of the Macocha abyss in 1784 is associated with his name as well. 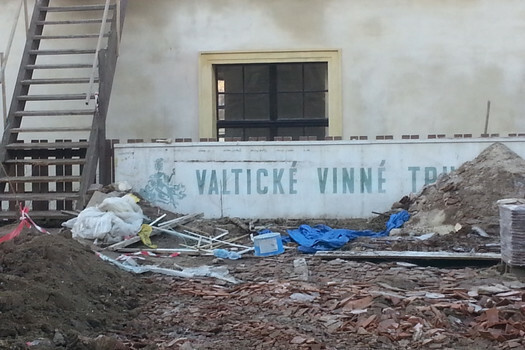 The first known mention of the theatre in the Valtice Castle area comes from December 1696. Neither the then record about a purchase of canvas for the theatre, nor the data about theatre performances are sufficient evidence of what was existing on the scene in Valtice at that time. There is no evidence that this could be the forerunner of the present theatre between the Castle and the left wing of the front castle premises. 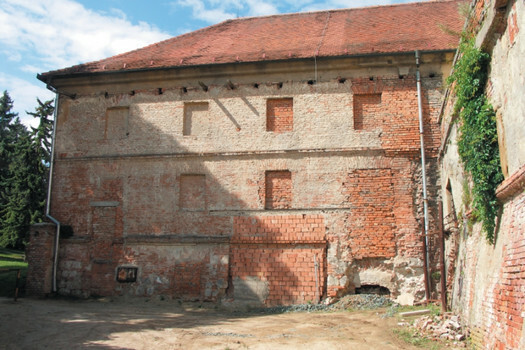 The vestibule of the reconstructed theatre is situated in the old pressing plant from 1719 with walling and vaults which are probably the oldest part of the premise. 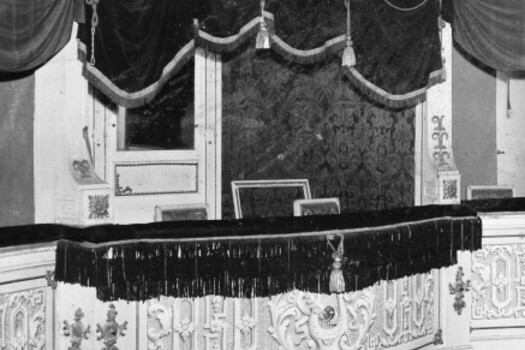 The first performance in the Castle Theatre took place in November 1790 to honour the visit of emperor Leopold II. 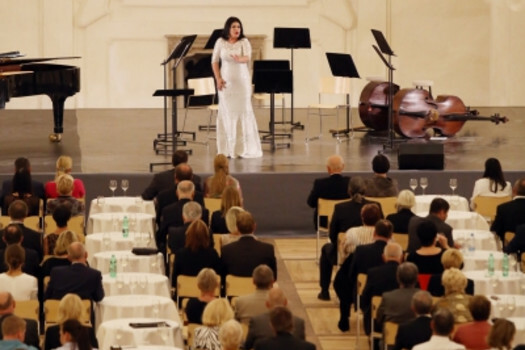 It was the „occasional opera“ Prometheus which is brought to mind by an extant contemporary Viennese print of the libretto. There were Damascene or wickerwork armchairs in the lodges of nobility, and the others watched the performance on benches: some made of rough wood, some covered with red cloth. 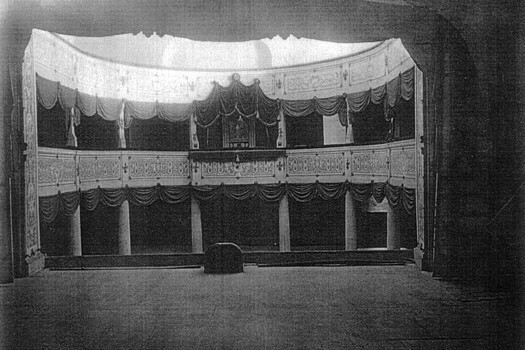 The stage was equipped with trolleys for the changing of backdrops, rails, ropes, cylinders for trapdoors, flying engine, rain, hailstones, thunder and lightning strike appliances, wheels for pelmets and other devices, which should also be the part of fully functional replica of the scene. 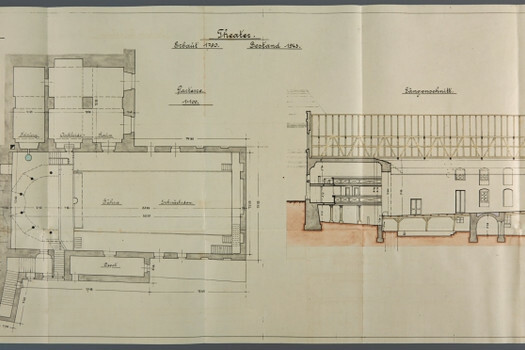 In 1793 the rope-maker Gilbert´s adjacent house was successfully purchased, and 19 feet (about 6 metres) could be added to the length of the theatre. It perhaps corresponded with the original intention. 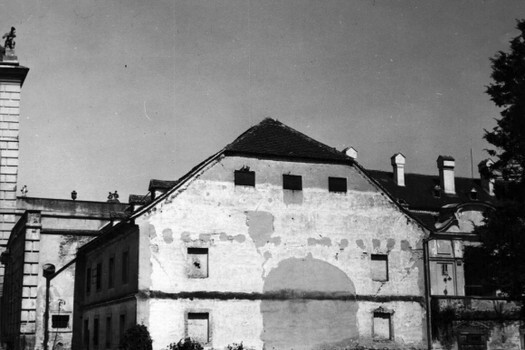 Barvířská street, which at that time still existed, was partitioned by the enlarged theatre and under the stage was a vaulted gateway which is still commemorated by an exant stone portal. 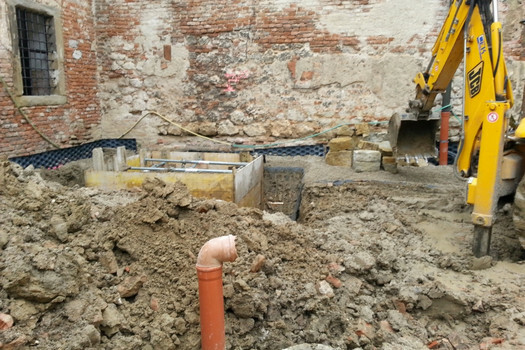 A walled vault of the gateway under the stage was restored to the original state and serves as a connecting way to the technical facilities of the theatre. 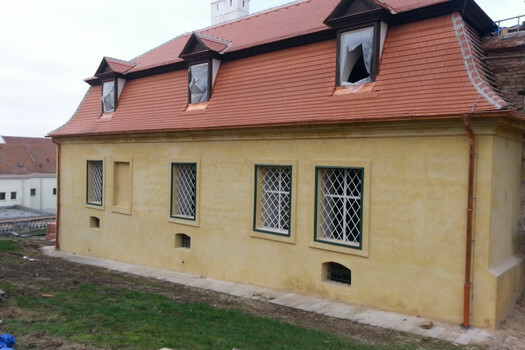 The remaining houses, in Barvířská street, were purchased at the turn of 19th and 20th century, and the park was created in their places. 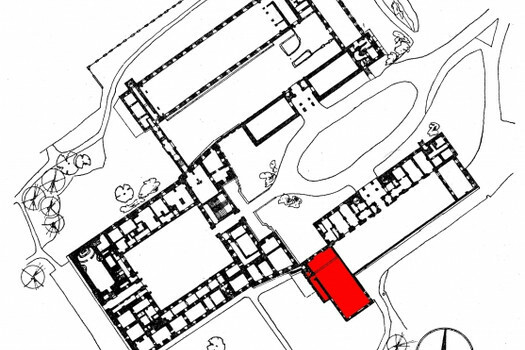 From the beginning, the building was enclosed by a purpose built annex: most probably wooden store rooms. 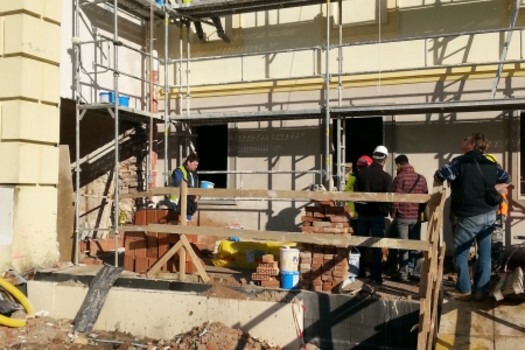 One of the few surviving components is the main entrance to the theatre. It consists of the semi-circularly edged portal pilasters with a foot and a Roman head bearing the castellated entablature. Originally there was an inscription dating the creation of the building in the oblong field above the entrance. The two door wings with a semi-circular tympana are separated by a column. The left door led to lodges and into the Castle, the right wing led down to the parterre where a long list of decorations was once written up. 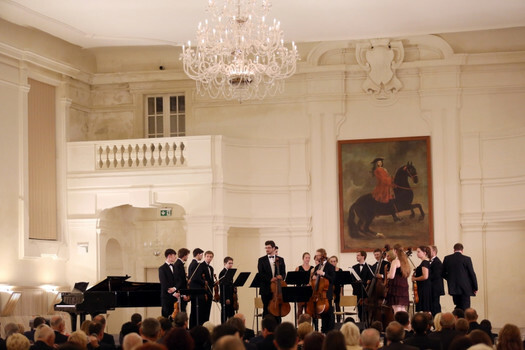 Unfortunately the decorations, which could have been works by outstanding Viennese court artists, have not survived. The unoriginal neo rococo decorations, which we know from some existing photographs, come from the late 19th century; and they perhaps relate to the visit of the emperor Franz Joseph I in 1876. 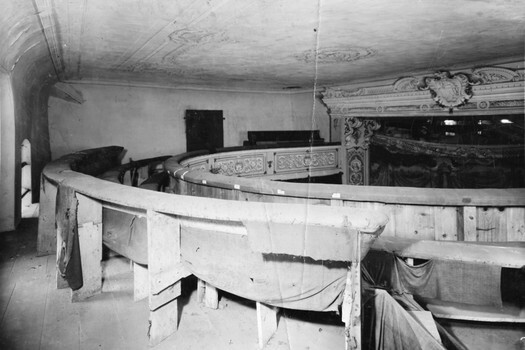 In the 1930´s, the theatre was relatively well preserved. A planned conversion into a cinema did not eventuate, but the end of the war brought its downfall culminating in a metamorphosis into a tractor depot. 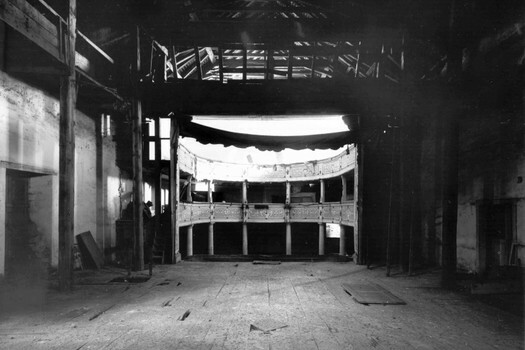 In sixties, the semi-hipped end over the rear wall of the stage was brought down. The wooden truss was replaced with the steel one with a saddle hip roof. 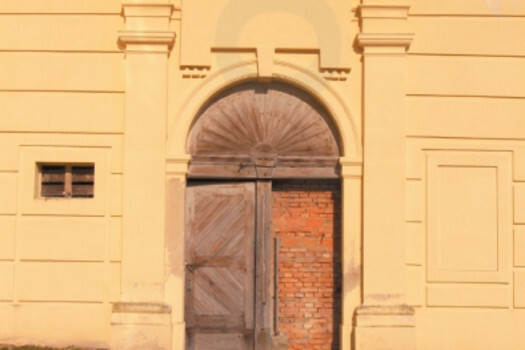 A Gateway in the south-eastern wall along the pressing plant was broken through to enable an entrance for tractors. 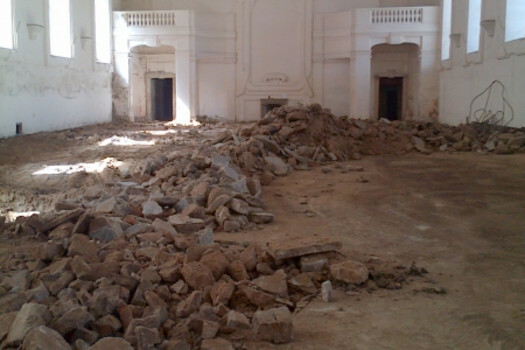 The devastation and degradation culminated by the construction of the concrete stage in the place of auditorium and the placing of a chimney in the rear part in the 1980’s. 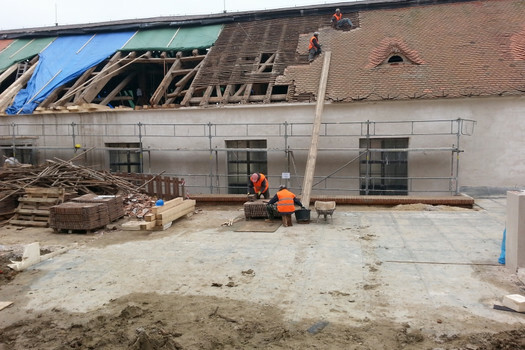 During the reconstruction (from April 2014 to June 2015) the steel truss was brought down and the wooden construction of the roof was renewed to the original shape with the semi-hipped end and windows. 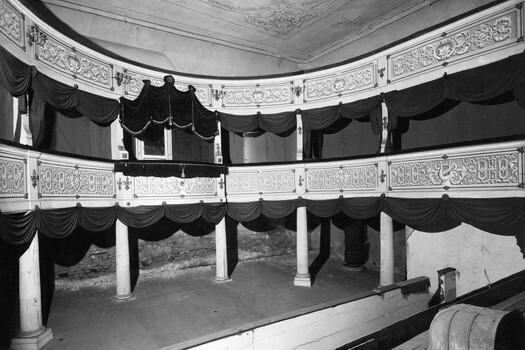 The post-war concrete and bricked constructions were removed; and after detailed archaeological research was carried out, the theatre with the only preserved circumferential walls was equipped with a modern technical infrastructure, a replica of the baroque machinery, and the original layout was brought back to the theatre. 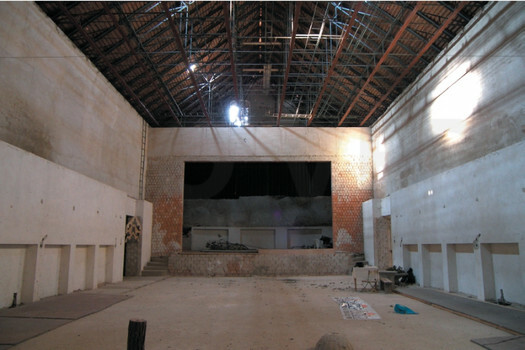 It has created a unique theatre stage which enables reconstructions of contemporary performances. 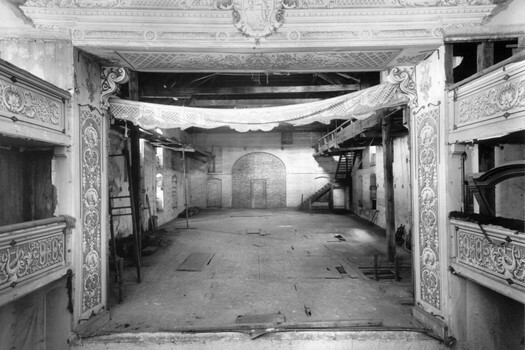 In contrast to some other similar castle theatres, this stage’s operations are not limited by the protection of historical monuments. It provides visitors with an art experience similar to the one enjoyed by previous generations, no matter of their parentage or actual social status in the parterre, the lodge, or the gallery. 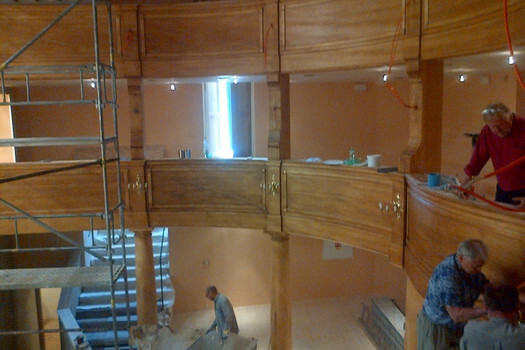 Visitors have been able to see the reconstructed appearance of the Castle Theatre in new tours since July 2015. In 1560, the Liechtenstein senior lost the indebted Mikulov domain, and his successor in seniority Hartman II (1544-1585) residing in Valtice (then Lower Austrian Feldsberg) gained Lednice. 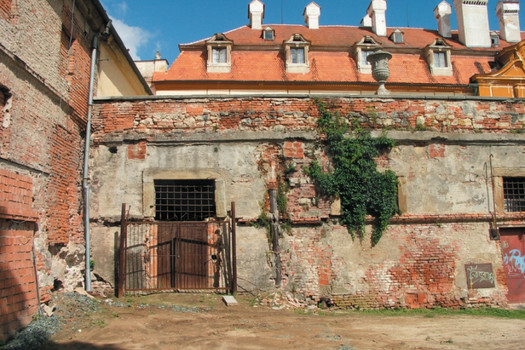 This enabled a huge building development of the later main princely residence in Valtice. 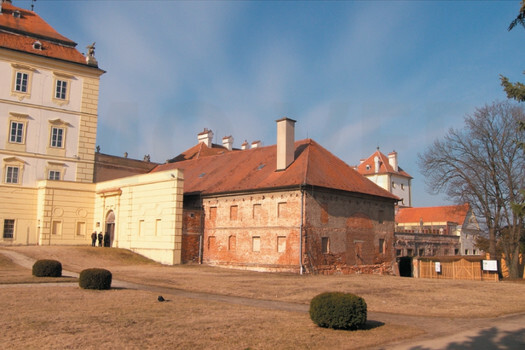 In the 17th and 18th centuries, the Valtice Castle was in a shape close to its present state. 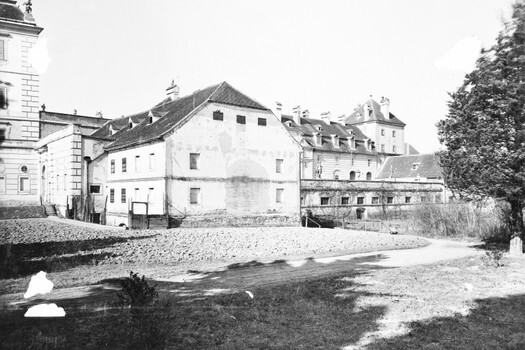 It was partly constructed on the basements of older buildings. As early as the rule of Karl I (1569-1627) and his son Karl Eusebius (1611-1684), the palace complex, including three courtyards surrounded by a number of farm out-buildings, was created under the supervision of many Italian master builders. Sources mention that a place for the stabling of horses was in this area at least from the beginning of the 17th century. 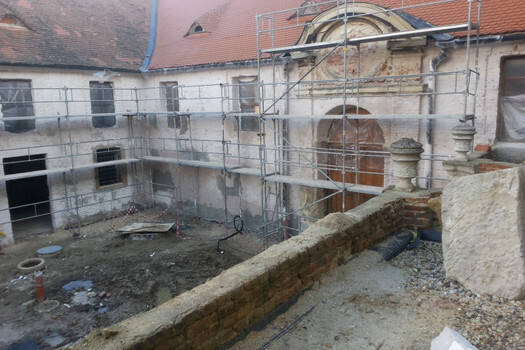 Wilhelm´s “History of the Development of the Buildings in Valtice Castle” states that directly on the platform in front of the Castle moat, Andrea and Jan Baptist from the Erns family created the Riding-Hall and buildings around the first courtyard. 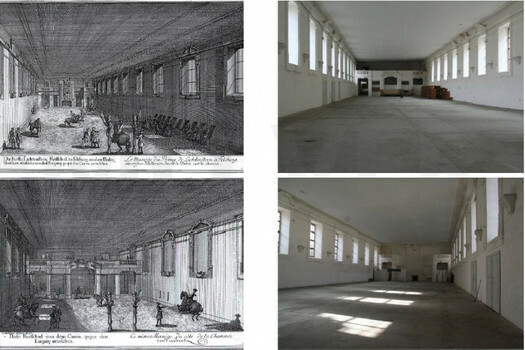 The sources do not offer a satisfactory answer to the question if the 85-meter-long building was in the same location as the present Riding-Hall. 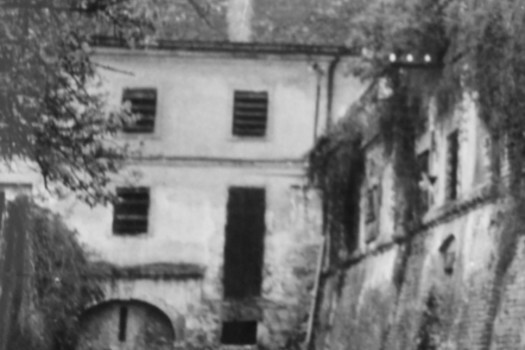 Its location on the left edge of today’s western front part of the Castle, i.e. the area of the present upper stabling (existing information centre) seems more probable. The basic contours of the homestead yard and its buildings come from that time for sure. 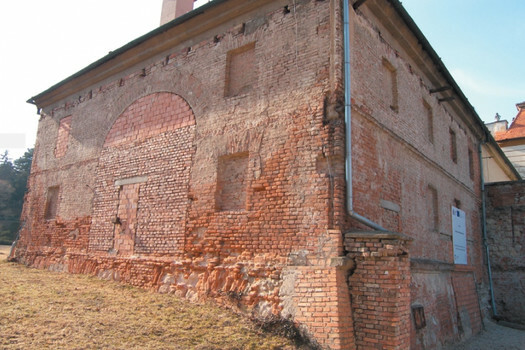 Large facilities for horse breeding and stabling was part of the usual facilities of residences of monarchs or high aristocracy at that time, and their size and quality confirmed the social status of the owner of their domain. Horses were not only means of transport, companions in fighting or hunting, but they were one of the determining phenomena in the lifestyle of the courts and nobility. Let us remind you about the prestigious courtly horse breeding in Lipice and Kladruby which had already came to existence by the last quarter of the 16th century, and at the same time as the Spanish Riding School of the Viennese court was founded. Dressage was then not only for amusement. The obedience of horse and its connection with a rider were often essential conditions for survival in battle. 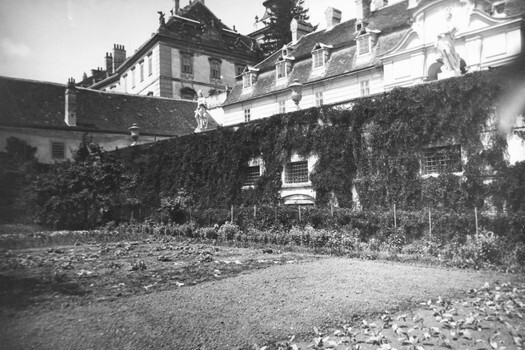 During the rule of the Emperor Maxmilian II at the court residences, very extensive buildings for horse breeding were undertaken, and all the high nobility followed the example of the monarch. 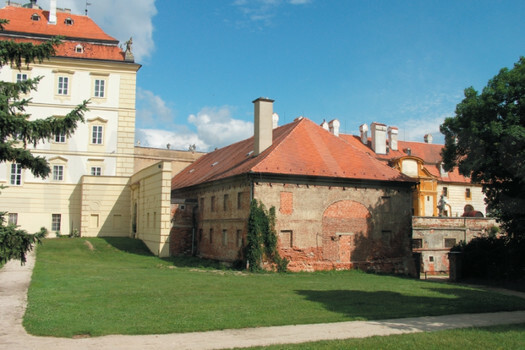 „The Horse Castle“ in Lednice, is the best example of the care of horses, as well as an example of posh stabling of the Wallenstein palace in Prague which is the place where today the Upper Chamber of the Czech Parliament sits. The above mentioned Karl Eusebius is usually considered to be the founder of the Liechtenstein horse breeding, and its firm foundations had most probably already been laid by his father Karl I, or perhaps through marriage with the Úsov domain: horse breeding belonging to the Lords of Boskovice. Many consultations about breeding, exchanges, and purchases of horses with a number of important noble families are well documented. 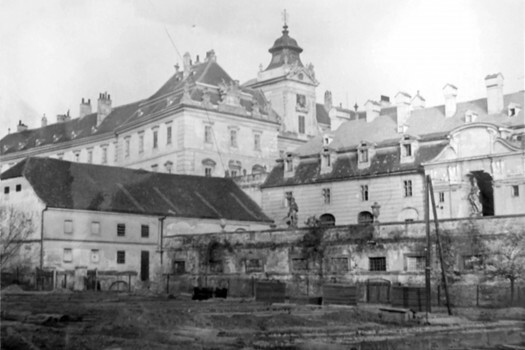 In the second decade of the 18th century, the Upper Stabling and the Spanish Stabling came into existence in the front part of the Valtice Castle. 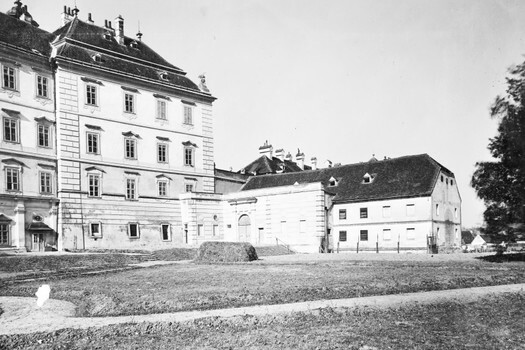 According to the results of research into the historic of construction, the extent of the front parts of the Valtice Castle – (the homestead yard) as specified before its extant shape with a triaxial portal, stabling, and the Winter Riding-Hall – was developed after the arrival of the Prince Anthon Florian (1656-1721): a courtier for Emperor Karl VI and his architect Anthon Ospel. The lengthwise roofed riding-hall then probably had a two saddle construction with a central valley. 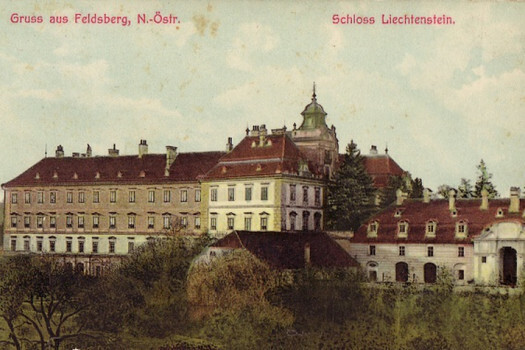 The truss was remarkably modified in 1871 because the truss’s extension created a mansard roof of enough height not to block the view of the Mikulov Castle and Palava Hills from the princely residence over its ridge. 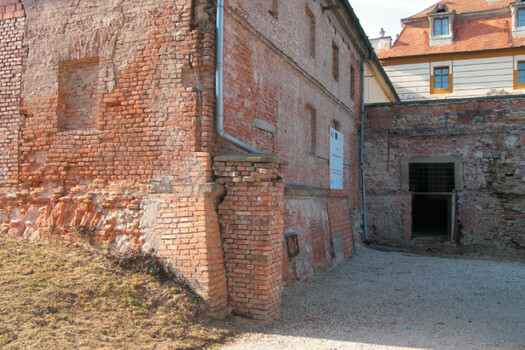 The newest building of the homestead yard in the front part of the Valtice Castle is the connection between the Stabling and the Castle which was constructed approximately in the middle of the 19th century. 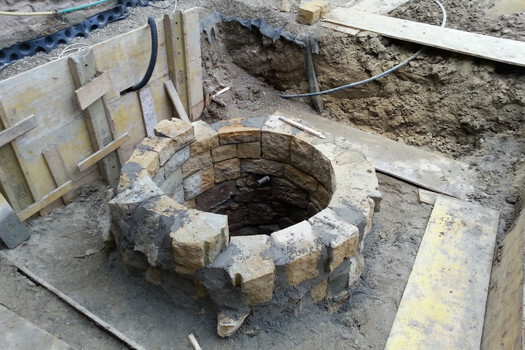 At the turn of the 19th and the 20th century, modification of the walls of the terrace and the fountain was done. The smithy and store rooms were then on the terrace along the Upper Stable. 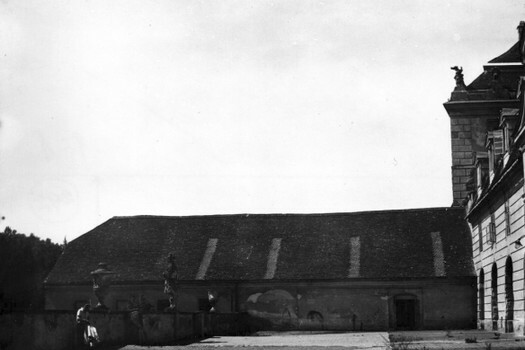 After World War II, the Winter Riding-Hall was used as a tobacco kiln. 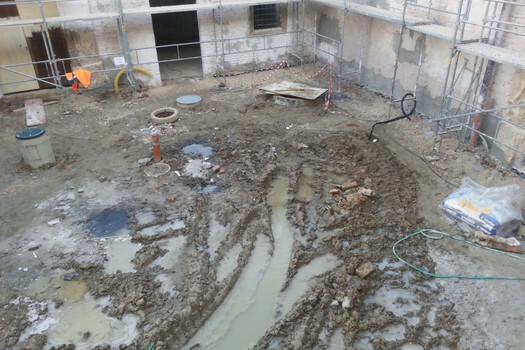 A drying machine was installed here, the floor was concreted, and a boiler room was built in. From 1970, a gradual renovation was undertaken: controversial from the viewpoint of monument protection. 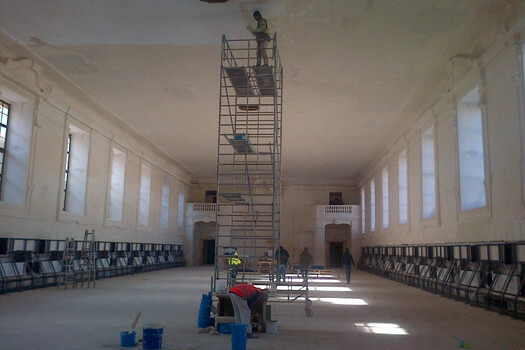 The intention of the freshly finished reconstruction of the Stabling is its return to the shape it was in during the 18th century. At the same time, a fully functional space for the holding of cultural and social events with sufficient technical facilities was built. 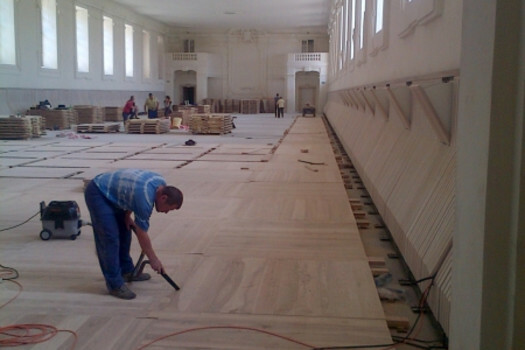 After archaeological research was carried out, the floor was completely reconstructed. 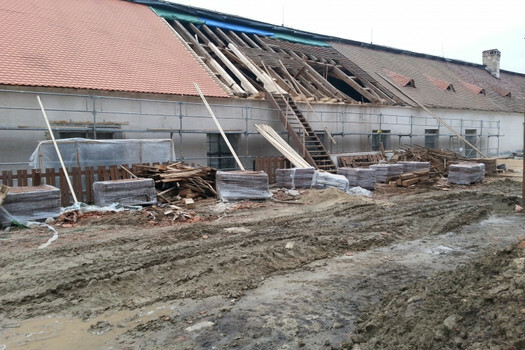 According to extant fragments, its covering with wooden planks on the grid of beams was renewed. 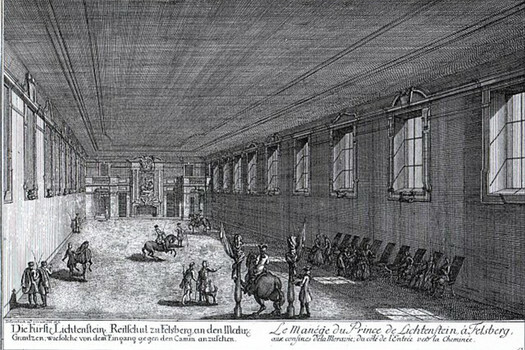 Similar floor in the Stabling survived, for example, in the Vladislav Hall in the Prague Castle. 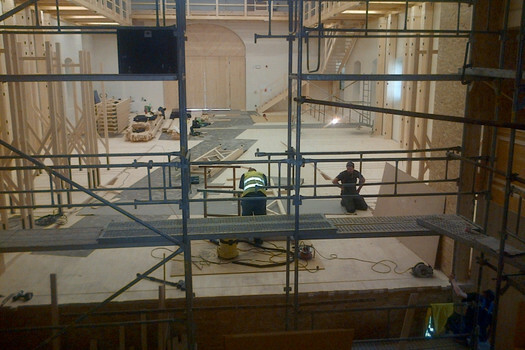 The building was supplemented with the necessary technical equipment for the comfort and safety of the visitors. Some of the technology was placed under the floor, some of it is hidden under the lambrins around the walls which should evoke the original function of this space. 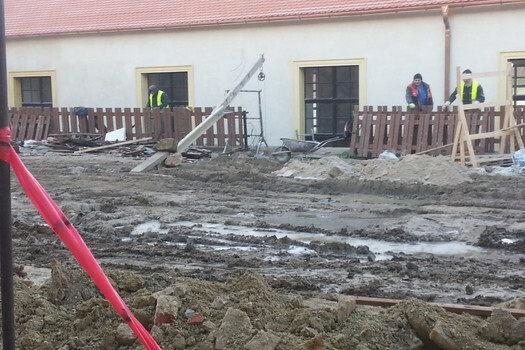 A new building with facilities was constructed below the level of the service yard. 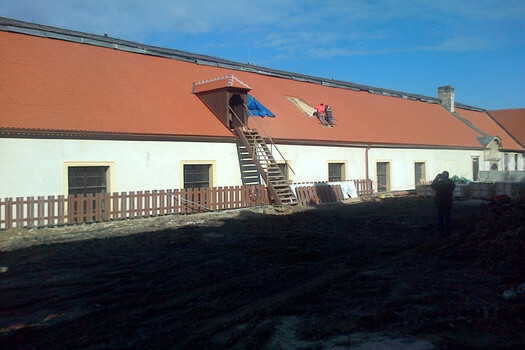 Unsound parts of historical truss and roofing were renewed. 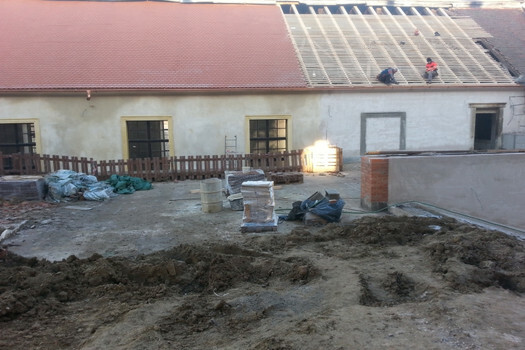 Follow up works on other buildings will finish the general modification of the homestead yard for holding cultural and social events in the open air, and in the case of rain the historical Winter Riding-Hall will be used. 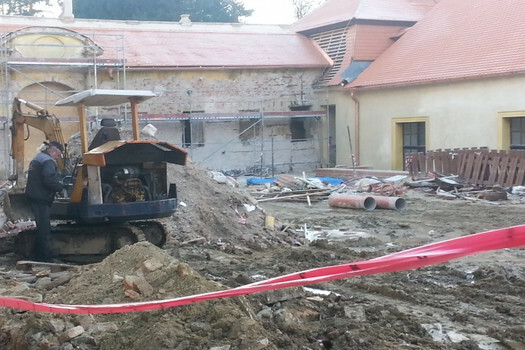 Together with the rooms of the Spanish Stable, gallery over the Riding-Hall with the lounge and service rooms in the basement of the adjoining garden house, the Riding-Hall will create a multifunctional complex capable to satisfy the needs of visitors and organizers. 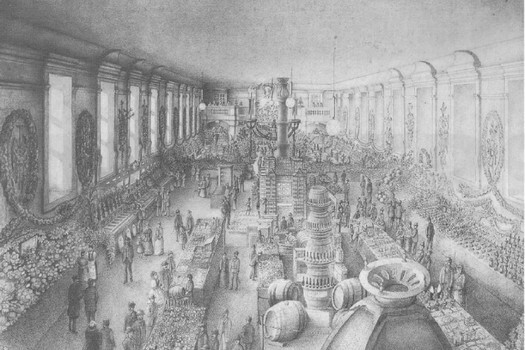 The Riding-Hall has almost one thousand and two hundred square metres, and its potential capacity corresponds with this area.